The black church has been a nexus of power and hope for centuries. Urban congregations were the basis of the Civil Rights Movement; in 1963 in Birmingham, no matter how violent and chaotic it got, the 16th Street Baptist Church was home base where nonviolent protestors marched, were scattered and arrested, and came back to again and again. 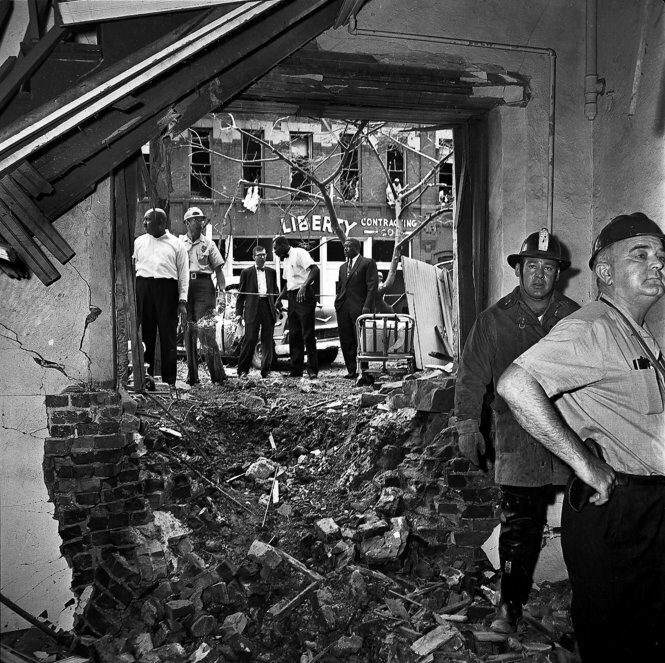 Shortly after the Campaign, the whole church was dynamited by KKK members, killing four girls. The symbol of black resistance was destroyed, part of a campaign of white supremacist terror. Not only was the sanctuary of the church desecrated by the massacre of nine people in Charleston, this open wound has been salted by a string of church fires. As of writing, the number of fires is eight, with three confirmed arsons and four without a cause yet. The lack of interest by many media outlets in the story spawned the hashtag #WhoIsBurningBlackChurches. The answer is both “we have no idea” and “we have a very good idea”. Who specifically? Investigations are ongoing. Who generally? White domestic terrorists, the sort that have dominated the history of terrorism in America. While Islamic extremism has been the dominant focus in America for the past two decades, outside of September 11th, 2001, domestic terrorism by racist and “patriot” extremists has always been a more relevant threat- since 9/11 almost twice as many people in the US have died from right-wing attacks than by Islamic radicals. The 1990s had the Oklahoma City Bombing, which was the deadliest action before 9/11. Going back far into the past, America was defined by lynch mobs, church bombings, slave patrols, etc. Beware media stories that call this some kind of anomaly. Given the past, and American society’s lack of interest in confronting systemic racism, we should not be surprised that black institutions are defiled and destroyed. The question “who is burning black churches?” reveals that the War on Terror has never directed resources into confronting the dark heart of domestic terror. The Obama administration and Congress seems to be more interested in bombing peasants in Yemen than in churches being destroyed in several Southern states. No big effort has emerged to systematically protect churches and the black communities that they reside in. As with many social problems, the oppressed groups are told to deal with it on their own. At the Unitarian Universalist General Assembly last week, Dr. Cornel West stated that if all this violence was matched in the way that white establishments do, there would be no peace. Violence against black America happens so often that it would be a continuous civil war. What makes church burnings like this series strange is that few, if any comparable actions are taken against white-led churches or other institutions. When property is destroyed in racial conflict, like the CVS in Baltimore, there is a media obsession with it. Several historic churches, with great cultural and social importance, get nowhere near the same coverage- simply because the group that committed the crime and group who suffered it were different than they were in Baltimore. I was born in 1990, about a full generation after the end of the capitalized Civil Rights Movement. Church attacks were taught to me as historical, emblematic of a hostile, racist society that no longer exists. But there is no separate, post-racial era. This is just a modified version of Jim Crow. Same inequality, same terrorism. 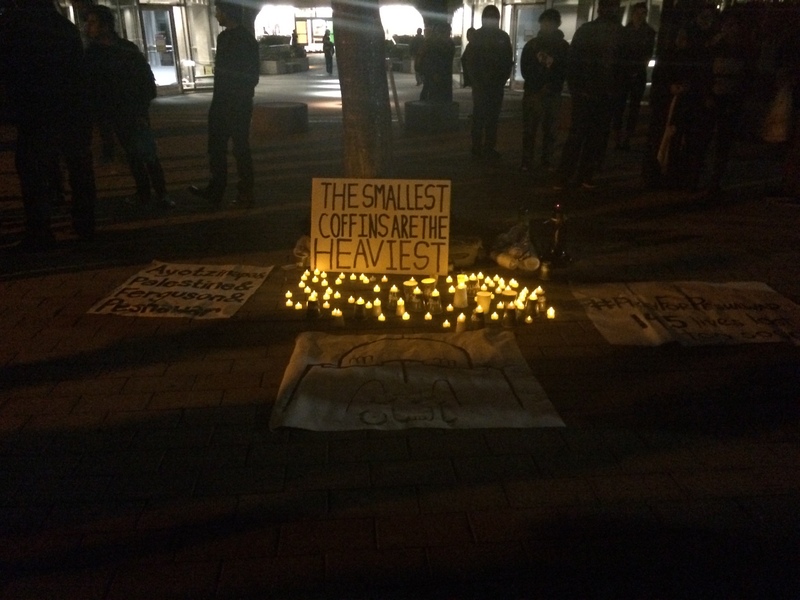 UCSD students held a vigil Wednesday as people around the world mourn the massacre of children at a school in Peshawar, Pakistan. Whatever your politics, it should be a common point that the most innocent and defenseless are off-limits in any conflict. When children are reduced to a statement of brutal conviction, all justice and humanity is destroyed. 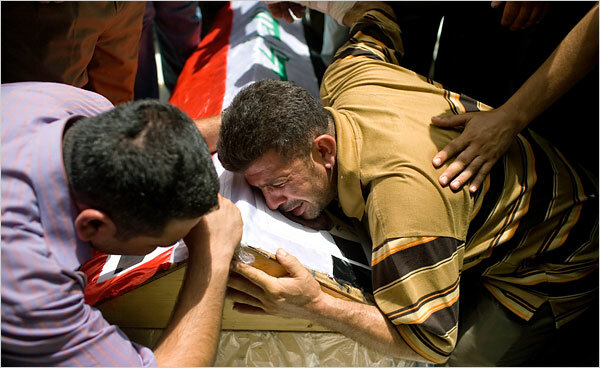 A new, more rigorous and well-structured study about the civilian death toll in Iraq has been published, a successor to the controversial Lancet studies of 2004 and 2006. Taken in 2011, it used a more representative sample and was able to survey most of the country- the Lancet studies had to deal with serious amount of violence and parts of the country that were a no-go for researchers. Ultimately it puts the combined deaths of the conflict and the huge migration in and out of the country at just over 460,800. Three-fifths of the non-migratory deaths were violent in nature, the rest caused by the breakdown of services and infrastructure, like hospitals. The figure is contrasted with the second Lancet study, which put the number at over 650,000, and the Iraq Body Count, which relies on confirmed deaths, in in the 100-125,000 range. As in most surveys, a simple count will miss certain groups and regions. The new survey makes well-founded estimates and will be the standard by which any future evaluations are measured. 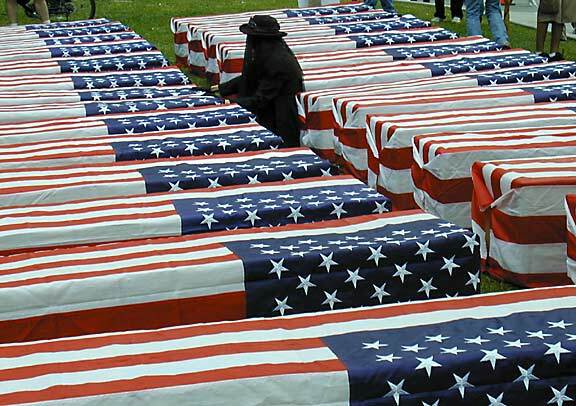 Americans are aware the American lives lost, but have very little idea of the massive amount of Iraqi civilians who perished as the result of the invasion and multi-pronged insurgency that followed. A 2007 poll (PDF) found that the a majority of Americans thought less than 10,000 civilians had been killed- only 15% thought it had reached six figures. Of course, this new study reminds us once again how incredibly pointless the Iraq War was. What little was accomplished (such as a more democratic Iraq) seems to be crumbling- the exit of the last troops was followed by the arrest and trial in absentia of the Sunni vice-president. A great many lives could have been saved by using the hundreds of billions of dollars spent to create infrastructure and eradicate disease. Universal healthcare could have been a reality years earlier. Using the Cost of War site, one can calculate what portion of war spending your town contributed. By their calculations, the money spent in Iraq was enough to supply every household in the city with solar power for forty years (obviously more, given falling solar prices). So it is a good point of meditation. And it asks- if Iraq was such an expensive, bloody, pointless war, how did it happen? And how can people, in outrage and solidarity, keep it from happening again? Most pictures that end up in my Facebook news feed are pretty lame. It’s a jumble of half-baked memes, new age crankery, and shallow political content. Usually they fall through the cracks in my memory and are no more remembered than strangers on the sidewalk. This image, however, actually put me on an interesting train of thought. This post’s title is what my first reaction to this was. The idea that our society has a deficit of questions. There are many things that go unquestioned. Many things that are questioned aren’t questioned thoroughly. American culture and people are considered boisterous and noisy, but in many aspects our culture is one of silence. If I gave you five minutes, you could probably come up with several questions that are not asked due to a sort of gentleman’s agreement. National political discourse tends to exist on a shaky foundation- what public figures say and do is only justified when many things are off the table. How do you win a war on terror? How do you prevent terrorism in the long run? Why do we trade openly with Saudi Arabia, when a 2002 Council on Foreign Relations report (PDF) states that the Gulf States are the biggest financiers for terrorist organizations? Why do we condemn countries for torture, cracking down on dissent, and election irregularities, when the same could be said of us? How can we ignore that some of our institutions, like employer-based healthcare, don’t work? As one of your teachers may have said, there are no bad questions. This isn’t always true, but it seems that for every issue that Americans are outspoken and passionate on, there is another that they ignore or take for granted. Uncomfortable truths do not go away. If you confront them, they do become less scary and more approachable. Ignoring the truth is not a long-term solution.